A rendering of what the project could maybe look like. The money is intended to cover the final engineering for the project and the beginning of construction, which is slated to start by late 2019. NYSDOT would manage both. That $3.1 million is on top of the $375,000 that Capitalize Albany, which has been heading up the project, got via the Regional Economic Development Council process for design, planning, and engineering. There's an event at the Albany Heritage Area Visitors Center at Quackenbush Square this Thursday, March 8 from 5-7 pm to gather public input on the project. There is also an online survey if you'd like offer input that way. The green marks that ramp that would be repurposed. 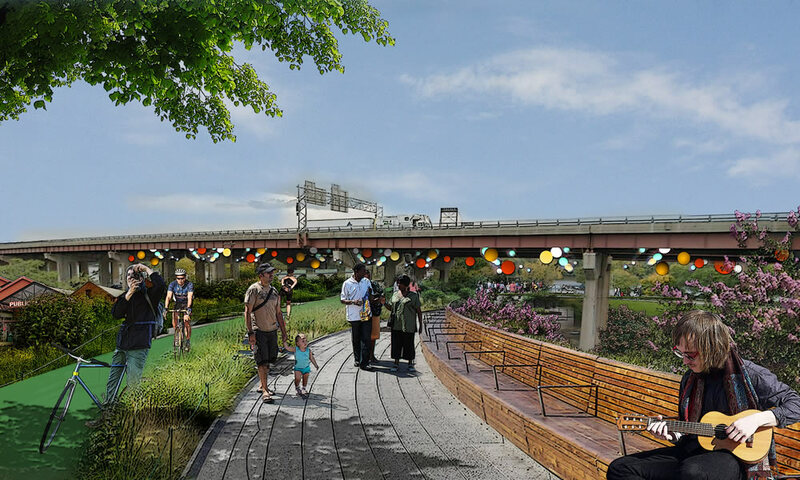 This forum kicks off the first phase of a multi-phase project that will ultimately result in the conversion of the I-787 northbound exit ramp from Quay Street to Clinton Avenue -- into the Region's first and only highline park -- the Albany Skyway. The Impact Downtown strategy found that the current exit ramp is underutilized, redundant to other exits, and could offer more to the City, and Region. As part of the Skyway's Phase I, [Capitalize Albany] is working with engineering firm, Stantec, to complete initial design and engineering. The firm's scope of work includes a site assessment and feasibility study, traffic impact study, planning and preliminary design work and other related activities. Earlier, very rough estimates pegged the cost of this project at $5 million-$12 million. On Monday Capitalize Albany president Sarah Reginelli said a much more specific estimate of the costs will be one of the products of the feasibility study, and that will help with planning how the project might be broken up into phases -- maybe the decommissioning of the ramp and park conversion is phase one, and then the addition of more amenities such as enhanced lighting or art or other treatments later on. Some of that could be determined by what priorities members of the public express for the park. Another important issue that's part of the feasibility study: Hashing out ownership issues of the new park and how to cover the costs of maintenance into the future. "We want to vet all this now so that city and state know the full picture," Reginelli said. Here's a sign-up page for event -- registration is not required, though Capitalize Albany says it would be appreciated. The first public word of this project surfaced as part of the Impact Downtown Albany "playbook" back in 2015. And, as we wrote at the time, it seemed like a longshot. But the $3.1 million announced by the state Monday makes it much more likely that it's actually going to happen. Sarah Reginelli credited Albany mayor Kathy Sheehan for supporting the idea from the beginning and talking it up with the state's various agencies. "She immediately gravitated toward it and identified it as a game changer," Reginelli said. 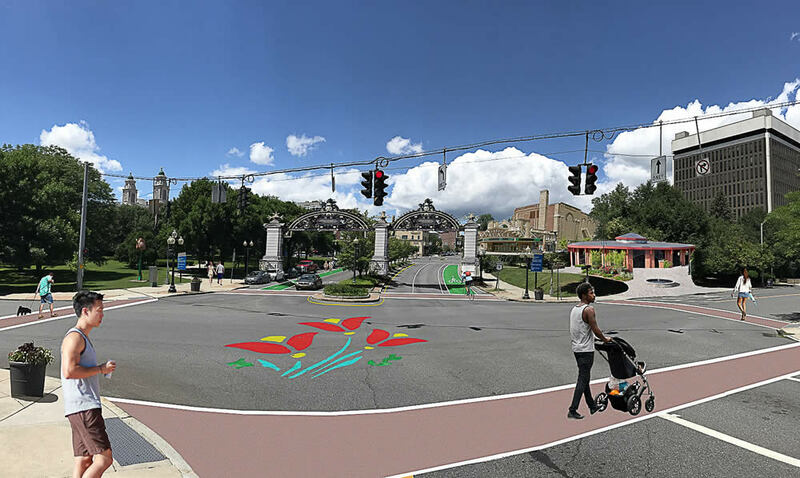 The Skyway project is now part of a larger group of efforts, public and private, around the Clinton Square area of downtown Albany that potentially could change that section of the city significantly. On the public side, officials are looking at ways to make the spot more of a gateway -- not just for people entering the city, but also as connection point for multiple neighborhoods. + The proposed Quackenbush Center mixed-use project just on the other side of Quackenbush Square on Broadway has gotten approval from the planning board. + A company called Home Leasing is proposing to renovate approximately 70 buildings along Clinton Ave in Arbor Hill to rent as affordable housing. + And if you draw the circle a little wider from the spot, there are projects like the redevelopment of the Ida Yarbrough Homes and the construction of 88 new apartments at 760 Broadway. And the Skyway project could add to the momentum. But it's also worth focusing on how the Skyway and the transformation of this section of the city could also help people who are already there and in nearby neighborhood such as Arbor Hill and Sheridan Hollow in terms providing access, opportunities, or otherwise increasing quality life. So if you have something to say about the direction of this project, it sounds Thursday's event -- and that survey -- is a place to start. This is nuts! Don't try to replicate the Hi Line in New York City. That would be a huge unnecessary waste of money. You could do far more with less. You can make street level access to the waterfront, that would be cheaper, easier and more pedestrian friendly. Don't try to make a silk purse out of a sow's ear. Tear the ugly thing down and do more to make the downtown area decent. Make a park where all the empty lots are around the hideous bus station- which should also be removed. Instead re-fit the old bus station on Broadway or make a new one connected to the old train station which should be returned to service. This would make access to the city easier and far, far more pleasant, promote tourism and revitalization of downtown. It seems like this is the consolation prize from Cuomo's I-787 study that pretty much concludes that they will never take down or bury 787. I agree that comparing to the High Line is not a good idea, these are two totally different markets, locations and conditions. I really hope they prove me wrong here and that it turns out to be an awesome place where people want to be! I couldn't agree with Peter more. The High Line would not succeed if you dropped it over I-787. (For one thing, that hipster in the visualization would barely be able to hear his own ukulele over the roar of traffic below.) Invest in the neighborhood, not on outdated and unmaintainable infrastructure. I'm not against making Albany more pedestrian and bike friendly but this makes very little sense to me. I take that ramp every morning and will have to find another route to get to work but I can adjust. However, the end of the ramp is at the intersection of Clinton and Broadway - it's crazy busy during the week and I can't image where pedestrians and bicyclists will go. Are they going to put a designated bike lane on Clinton or Broadway or North Pearl? If not it's pretty short sighted. Why does everyone always hate on Albany and then hate on ideas to improve it? I think this sounds great! I’m looking forward to utilizing it. Emily is right, this is the consolation prize, but that's because 787 isn't coming down anytime soon (or ever). The skyway project is a creative way to deal with that reality, and has the potential to be a great city asset. If you want to better understand the challenges of removing 787, go to the open house at the Washington Ave Branch of the Albany Public Library next Tuesday from 4-7pm. I agree that this is a bone thrown to Albany; and that the park has slim, if any, chance for success. Now Albany has not that many choices - keep it, drop it, or... maybe trying to funnel allowance into something more useful? Demolition of Central Eyesore comes to mind as an alternative; sewer upgrade is also a good idea.. Tear it down and open up the view to the river. Cheaper and better in the long run. Remember, DOT may be responsible for it, but they won't be maintaining it like a park. This is honestly really dumb, and the novelty will wear off. Can we just have a very direct and efficient pedestrian-friendly way to cross 787? Spend the rest on beautifying existing parts of Albany and doing things with dead space. I know that's not how grant money works, but still.. The city couldn't even be bothered maintaining two small flowerbeds in Yolles Contemplation Garden in the Mansion District, so they tore them out and filled the holes with concrete and a picnic table. They pulled up all the flowers and cut a tree down and filled it with rocks. I'm sure the people that eventually move into the McMansion condos at Quackenbush square will like it. This project has the ingredients of a step in the right direction for a city that could use more urban revitalization, innovation and sustainable-like projects to enhance the city’s livability and green-future capabilities but it somehow escapes and embraces the biggest problem: the I-787. The 787 is a massive detriment to Albany and its residents and visitors alike as it diminishes direct access to the Hudson River waterfront, compromises the environment and health of local residents who deserve clean air and more parkland, and ruins the aesthetics of the city (the 787 is gray and looks horrendous). The 787 needs to be done away with in exchange for a riverfront boulevard and/or park that is pedestrian/biker/community/earth-friendly. Imagine the possibilities of such an exchange! You get the feeling that this project has good intentions but is a PR booster for Albany and the State, poorly planned, copies off of the High Line in NY (which is ridiculous as that project dealt with a completely different demographic, neighborhood density, city culture and potential, and infrastructure) and jumps over the true problem. Doing away with the 787 presents obstacles for many workers who come into the city for work but it’s time the city be bold and think big. Picture an Albany riverfront where its commuters actually embrace the city and are using public transportation, biking, walking, or carpooling to work and staying after work to enjoy the space. Peter (comment #1): I would love to see street level access, but walk over the pedestrian bridge to the Corning Preserve and tell me how you'd accomplish that. There are two sets of train tracks and six lanes of interstate in the way. I also agree about the bus station area but that's four blocks away, not really relevant to this project. It's important in a big picture sense, especially if a walking loop with Quay Street is the goal, but in that case it's not an either/or. Kate, I can see the right lane at the end of the ramp being stolen for ped/bike access. There's already bike traffic on Broadway/Clinton. Agreed this isn't an ideal solution but I-787 is not in an ideal situation. I am usually all about ANY idea that makes Albany a better, more livable, more modern place. I am the anti-NIMBY; I love the Highline; etc, etc. With that said, I still don't understand the choice of converting this ramp. The left ramp is the one we're talking about converting. The right ramp will remain an exit ramp from 787 where 18-wheelers will jam on their brakes as they decelerate from ~65mph to a stop at the intersection with Clinton & Broadway. No amount of greenery will make this a fun place to hang out like the Highline. Here's what I commented in 2016 and I still believe: "Put the millions that would be spent on this project toward finishing the connection between the park and the Helderberg Rail Trail. Orrr getting the Livingston Bridge suitable for pedestrians and bikes (or put it into the Gondola fund :)"
1) The ramp is used exclusively for northbound 787 traffic. From the entrance to exit 4 to the end of the ramp it takes 3 minutes to travel the 1.3 miles. Assuming the use of Water Street, from Exit 4, it takes 4 minutes to travel 1.4 miles to the same destination. Using exit 4 to take Broadway, it takes 5 minutes to travel 1 mile. The trade-off for eliminating local northbound access at this ramp is a 1 minute increase in travel time. 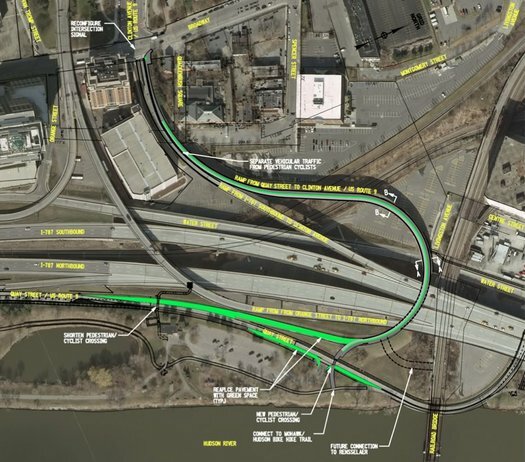 2) It would seem that DOT is ridding themselves of this ramp, and whether Albany wants it for a park or not, it will either become a facility the city inherits for traffic (which has agonizingly low volume and is a n albatross), or for another purpose. Or DOT tears it down. Those are the options. I don't know the annual cost on maintaining, plowing, and repairing the ramp, but even fiscal conservatives would agree that this cost, to support a potential 1 minute trip length offset for northbound traffic is not sustainable. 3) Could we/should we build elsewhere? Yes. But not to look at this as an opportunity? It's conversion is FAR much less expensive than building a brand new bridge from the ground up. The Hudson Riverway bridge cost $8.5m back in 2002. So, a $10m new bridge cost is not unfathomable. The city had to raise 1/2 that from the brick by brick sale. So, get $3m from the state for this, and raise a small percent locally (yes, we'd maintain any structure, this or otherwise) or maybe still get the $3m and come up with the remaining $7m ourselves... Keep in mind the Walkway is barely acceptable for use by bikes because of the stairs on the western approach. There's a bike rail but really. 4) This walkway makes for a very easy connection to the current Livingston Ave Bridge, which is slated to be replaced or overhauled. Considering that the "window" for that' bridges Western approach can not be moved car (track alignment and the immovable central warehouse, 787 at grade) it's near certain the bridge would be replaced in situ. The Skyway is less than 25' away from the Livingston Ave. Bridge's approach and AT GRADE. That's a very simple, low cost and achievable effort to connect the two structures and voila! The heart of Albany's downtown is very easily connected to the Rensselaer Waterfront. Because the Skyway appears to be fully accessible by people with mobility impairments (not to mention bikes, strollers and anyone with vertigo) it's definitively easier and safer to access than the current dogleg set up of the intimidating Dunn Memorial Bridge. Not saying it's the best thing since sliced bread. Few things will be, but there are benefits to taking this opportunity by the horns if we take the time to consider these it becomes less of a pie in the sky. What is the desire line for the ramp? I ride my bike on the trail almost every night in the summer and will always find it simpler to either cross over to the path using the underpass on Broadway or in the opposite direction, simply going over to North Ferry St to Erie Blvd and crossing there. If I'm a pedestrian I would do the same or use the ped bridge. The ramp option seems circuitous and not to mention the grades would be at best inconvenient for ADA accommodation. Its also probably about a half mile long. The ramp doesn't seem like a destination in and of itself. Where is everyone going anyway? J wrote, "Why does everyone always hate on Albany and then hate on ideas to improve it?" c) Therefore, we must do it. I love and hate Albany all at once....lifelong resident here. I love the city and hate our politics, and this is the kind of dumb idea we end up with thanks to our political history. There's no reason to give up on the idea to get rid of 787. I'm against anything that is going to bring more left-handed guitar players into Albany. I think it's a great concept, but Albany really needs to do the math and make sure it is fiscally feasible. How much will it take to maintain and operate the structure once it is converted? Will it somehow generate enough revenue to offset that? Will it improve property values or retail sales in the neighborhood? Albany needs to take a long, hard look at this. Even with the state construction funding, it may not be worth the cost.